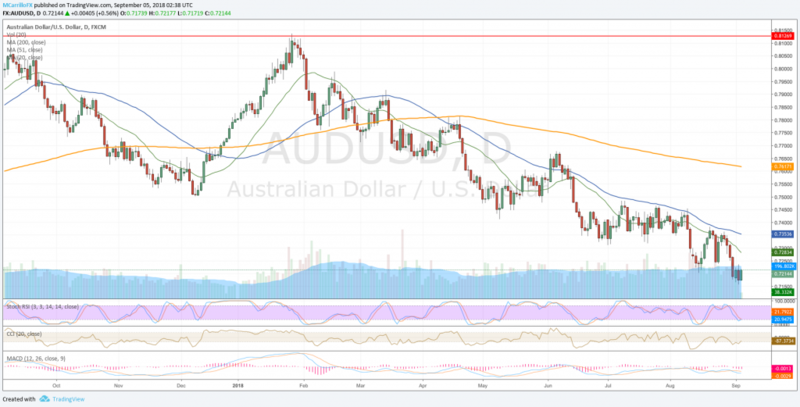 The Australian dollar is trading higher on Wednesday against its American counterpart following a better-than-expected gross domestic product report in Australia during the second quarter. The economy in Australia grew 0.9% in the second quarter the Australian Bureau of Statistics reported on Wednesday. It was a higher reading than the 0.7% quarterly increase expected. Year over year, Australia GDP rose 3.4% in the second quarter, well above the 2.8% expected by market and an acceleration from the 3.1% posted in the first quarter of the year. Long story short, the Australian economy is growing at its fastest rate in 6 years. The Australian dollar reacted positively following the news, and it is posting gains versus the US dollar. The pair has been trading at the same range between 0.7160 and 0.7220 in the last three days. AUD/USD is now in consolidation mode following the latest drop from 0.7360 on August 28 to 0.7155 on September 4. Currently, AUD/USD is trading 0.55% positive on Wednesday at 0.7215. Technical conditions remain weak for the pair as MACD is below its midlines and RSI is suggesting more dovishness. To the upside, if the pair extends its bounce from 0.7160, it will find next resistances at the 20-day moving average at 0.7280 and 50-day ma at 0.7355. Then, check for 0.7380 and the critical 0.7465 area. To the downside, if the AUD/USD is unable to consolidate gains, it will fall back to 0.7160, 0.7150 and 0.7000.